I wasn't quite sure where I should post this article. I'm not an Atheist, but I don't believe in most of the teachings of organized religions. Anyway, I read this on Yahoo today and the first thought that entered my so-called mind was "I wonder how many families $250,000 would feed?" "Bishop said in 2004 he was trying to help people, not impress them, with the statue. He said his wife proposed the Jesus figure as a beacon of hope and salvation, and they spent about $250,000 to finance it." "You shall not make for yourself a carved image—any likeness of anything that is in heaven above, or that is in the earth beneath, or that is in the water under the earth; you shall not bow down to them nor serve them." They skimped on quality of materials to make the statue. Yeah. I agree with bud. Why spend all those money in a statue when that same money could have fed hungry people or had put kids through college. I hope they don't even attempt to rebuilt it. Put the money to better use. That would've kind creeped me out if my husband and I drove up to that thing. Jesus looked like HE was the one that needed saving! Tell kids about the monsters and burning flesh in hell and then bring them to this thing at night (well, not anymore). I think tradition has Stephen King beat. YES!! The money could have been better spent! Last edited by herefornow; 06-15-2010 at 02:00 PM..
Why are people so concerned how other people spend their money? It's really none of your business. You don't know what he does with the rest of his money anyway. Stop judging others. Last edited by CantWait2Leave; 06-15-2010 at 03:22 PM.. It's not that I care about what "others" do with their money. I care what the RELIGIOUS do with their money. That statue is the OPPOSITE of what Jesus is all about. When those that say they are following Christ and His ways (looking after the poor, widowed, orphaned, illegal aliens, OUTSIDERS, etc.) build fancy buildings and huge statues (idols) of Jesus around the planet.........Well, Jesus is not impressed. Not the one I know, anyway. $250,000 grand could have bought a couple of homeless families places to live. There were hundreds of better ways to use that money than to build a statue of the one who had pity on the POOR and LOST. It is a bit of a mockery to me. I know the religious don't really understand what they look like to outsiders, but they look pretty foolish a lot of the time. (That thing looks like it is coming from the depths of some terrible place looking for help, or sinking in quicksand. I can't really tell ). Last edited by herefornow; 06-15-2010 at 04:35 PM..
And answered them, saying, "Which of you shall see Jesus fallen into a pit, and will not straightway pull him out on the sabbath day?" 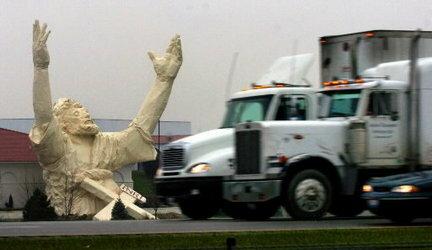 I'm a very commited Christian and I cringed every time I drove by that statue. The bible is very clear on making images of God. It's prohibited, plain and simple. Those who would make such an image, I just don't know what they are thinking.